The centennial flag of Valdese is a green-white-red (1:1:1) vertical tricolor with the town seal extending from the green stripe to the red stripe. The town site at http://www.ci.valdese.nc.us/ shows an image of a 1:2:1 green-white-red flag-like object that might be a logo for water conservation, or may be the current town flag. The image above appears to show a bleed through of black ink from a different design on the reverse of the flag. Valdese was formed as a Waldensian settlement. Although Peter Waldo was from Lyon, the Waldensian (Valdese) movement took firmest root in the Italian Alps, which is probably where the Waldensians in North Carolina came from. 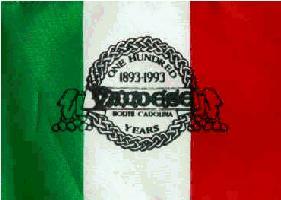 Thus it would not be unreasonable for the Valdese, NC, flag to have red, white, and green colors.